Happy April from Ticket Alternative! We’re celebrating Spring, knee-deep in festival season, and have a few updates that we’re excited to share with you! Minnesota United’s move to Major League Soccer this year provided the opportunity to improve efficiency and streamline data collection and reporting on ticket sales. 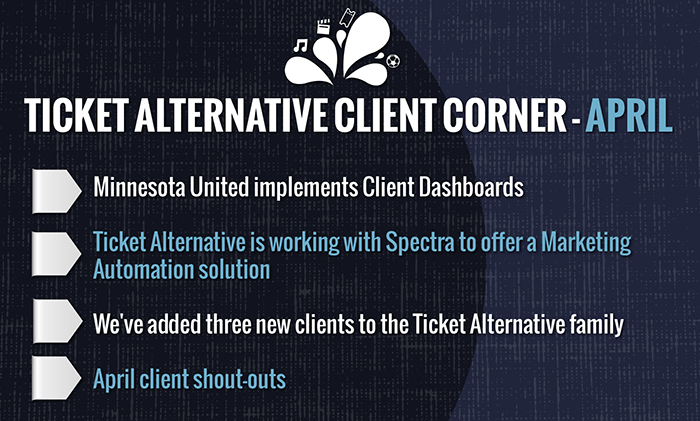 Ticket Alternative worked with MNU to launch Client Dashboards, a robust, easily customizable reporting portal available to database clients. Dashboards are built on our already powerful eQuery reporting platform to create even more user-friendly, visual representations of complex data for simplified comparisons. MNU can now more easily track ticket sales, promotion results, and upsell opportunities, as well as drive marketing decisions based on their data. Want to learn more about our Client Dashboards? Contact Iain Bluett. Once implemented, your team develops specific marketing goals (ie, email metrics, upsell conversions, page engagement, event follow-up) then creates targeted content based on offers and audiences that is then automatically distributed. For example, send a parking upsell email to anyone who purchases a VIP ticket. Another great example is a post-event survey. Develop questions that automatically sent to any past attendee to help gain feedback and understand insights about your event. Want to learn more about Marketing Automation through Spectra and whether it’s the right fit for your in-house Marketing efforts? Contact Iain Bluett. The Forum River Center – The Forum River Center is a premier venue located in heart of downtown Rome, GA. The multi-purpose 72,000 square feet venue offers an exhibit space, a 4,000 seat arena, and spacious banquet areas. The Forum opens their 2017 season on August 18 with Corey Smith. Riverside Epicenter – Located in West Atlanta, The Riverside EpiCenter is quickly becoming a hub for performing arts, fitness, and culture. In addition to the Bronner Center for the Performing Arts which houses 600 patrons, a box office, and state of the art audio and visual capabilities, the EpiCenter also houses the E, a complex with meeting space focused on inspiring people and empowering communities. The E serves as a beacon for entertainment, exercise, and engagement. The 2017 Season kicks off on May 14 with Mother’s Day Brunch. TrackTown – The Track and Field Summer Series Championship went on sale last week, ticketed by Ticket Alternative for the first time! The event is held in New York at the Icahn Stadium, a 5,000 seat track and field and multipurpose facility located on Randalls Island in the borough of Manhattan in New York City. The event boasts music, beer, and a fan festival all in addition to a 5k road race, corporate relays, and incredible team competition with some of America’s top athletes. Mill Town Music Hall’s Fall Concert Season went on sale this week. KSU Sports Park to host USA vs. Georgia (the country) men’s rugby match. The event will be held in June – tickets are on sale now! UGA Hockey at The Classic Center in Athens, GA season tickets on sale soon. Oakland Cemetery is announcing the annual Tunes from the Tombs line-up in April – stay TUNEd! Kingsport, Tennessee’s FunFest announced their 2017 line-up and are now on sale! Atlanta Blaze kicked off their 2017 season at Fifth Third Bank Stadium at Kennesaw State.